NEW ORLEANS – You might find it hard to believe, but there are only five weeks left in the NJCAA Division III Outdoor Track & Field season. 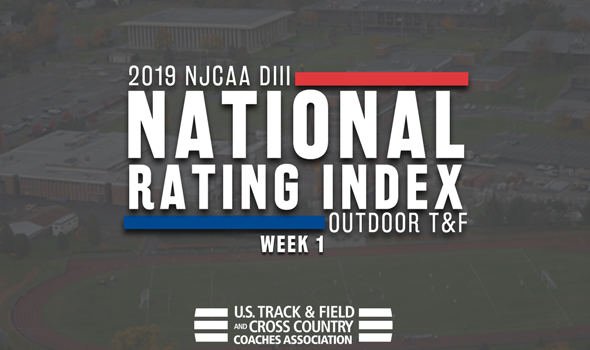 That means there is no better time to look at the first National Rating Index that was released on Wednesday by the U.S. Track & Field and Cross Country Coaches Association (USTFCCCA). Remember: The 2019 NJCAA Division III Outdoor Track & Field Championships are set to begin May 9 through May 11 in Utica, New York. The top of the Men’s National Rating Index is headlined by a pair of teams from Illinois: No. 1 Triton (Ill.) and No. 2 Harper (Ill.). The Trojans own the top spot thanks to 16 marks that are ranked in the top-5 nationally, led by Demariye Carpenter (No. 1 in the 100), Colton Weber (No. 1 in the pole vault) and the nation’s top-ranked 4×100 relay. Triton (Ill.) has three marks ranked second nationally: Xavier Josephs in the 110H, Anton Ranson in the triple jump and its 4×400 relay team. The Hawks have 14 top-5 marks of their own, paced by four that sit No. 1 nationally: Dakari Ferguson and Henry Halverson who are tied in the high jump, Sean Sanaghan in the 1500 and the 4×800 relay team. Don’t forget about Jeff Glatz or Zach Gunger, either, who are ranked No. 2 in the 5000 and pole vault, respectively. Rowan-Gloucester (N.J.) CC is ranked third in Week 1 and it has four top-ranked marks. Adam Hunt leads the way with two of them in the discus and hammer throw, while Mike Dowd and Edgar Rosa are tops in the steeplechase and javelin. Hudson Valley (N.Y.) CC and Kingsborough (N.Y.) CC round out the top-5. It’s going to be a close battle between Harper (Ill.) and Suffolk Country (N.Y.) according to the National Rating Index. The Hawks own the top spot in Week 1 thanks to a number of strong performances already this season. Harper (Ill.) is led by Misbah Baig in the 800 and 1500, Maddie Bobinski in the javelin and Rachael Temple in the 5000. All three of those women are ranked at or near the top of their respective events (Baig is No. 1 in the 1500 and No. 2 in the 800). Then you have the Sharks, who have five top-ranked marks in the early goings. A trio of field athletes leads the charge in the guise of Julia Stanger (high jump), Nikianne Otto (pole vault) and Nigeria Jones (long jump), while Allaura Dashnaw is No. 1 in the steeplechase, as is the Suffolk (N.Y.) 4×800 relay team. Rowan-Gloucester (N.J.) CC is ranked third in Week 1 and is paced by Elisia Lancaster and Emily Hilt. Lancaster is the top athlete so far this season in the discus and hammer, while Hilt owns the top mark in the shot put, as well as the No. 2 marks in the discus and hammer throw. Kingsborough (N.Y.) CC and Union County (N.J.) round out the top-5.